PALE OF SETTLEMENT (Rus. Cherta [postoyannoy yevreyskoy] osedlosti), territory within the borders of czarist Russia wherein the residence of Jews was legally authorized. Limits for the area in which Jewish settlement was permissible in Russia came into being when Russia was confronted with the necessity of adjusting to a Jewish element within its borders, from which Jews had been excluded since the end of the 15th century. These limitations were consonant with the general conception of freedom of movement of persons which then applied. At the time, most of the inhabitants of Russia, not only the serfs but also townsmen and merchants, were deprived of freedom of movement and confined to their places of residence. After the first partition of Poland in 1772, when masses of Jews living within the former country came under Russian rule, it was decided (1791) to permit the presence of the Jews not only in their former regions of residence, but also in the new areas which had then been annexed from Turkey on the Black Sea shore, in whose rapid colonization the Russian government was interested. On the other hand, Jewish merchants were prohibited from trading in the provinces of inner Russia. These decrees were intended to serve the national and economic interests of the state by preventing competition of the Jewish with Russian merchants and encouraging settlement in the desolate steppes of southern Russia; after a time these formed the provinces of *Kherson , *Dnepropetrovsk (Yekaterinoslav), and Taurida (*Crimea). 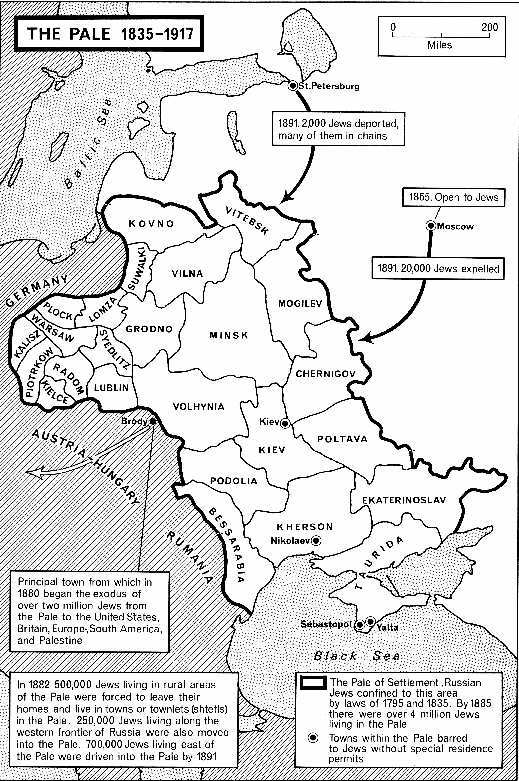 The Russian government also sought thus to reduce the excess of Jews in the branches of commerce and innkeeping within the territory annexed from Poland. In 1794 the earlier decree was ratified and applied to the regions which had been annexed with the second partition of Poland (1793) also – the provinces of *Minsk , *Volhynia, and *Podolia – as well as to the region to the east of the River Dnieper (the provinces of *Chernigov and *Poltava ). With the third partition of Poland (1795), the law was also applied to the provinces of *Vilna and *Grodno. In 1799 *Courland was added to the Pale of Settlement. In the "Jewish Statute" promulgated in 1804, the province of Astrakhan and the whole of the northern Caucasus were added to the regions open to Jews. In 1812, upon its annexation, *Bessarabia was also included. The "Kingdom of Poland," incorporated into Russia in 1815, which included ten provinces that later became known as the "Vistula Region," was not officially included within the Pale of Settlement, and until 1868 the transit of Jews through it to the Lithuanian and Ukrainian provinces was prohibited by law. In practice, however, the provinces of the Vistula Region were generally included within the Pale of Settlement. To sum up, it was the intention of the Russian legislators of the reigns of Catherine II and Alexander I to extend the Pale of Settlement beyond the regions acquired from Poland only to those areas where Jews could serve as a colonizing element. However, from the reign of Alexander II the restrictive aspects of the Pale of Settlement became accentuated, for while freedom of movement for non-Jews in Russia increased, in particular after the emancipation of the serfs, the restrictions on the movement of Jews beyond the Pale remained in force, and became explicitly underlined within the Pale itself. This was accomplished both by anti-Jewish enactments on the part of the government and by the growing impatience of Jewish society and liberal public opinion with these disabilities. Czar Nicholas I (under whom the term "Pale of Settlement" was coined) removed Courland from the Pale in 1829; however, the rights of the Jews already settled and registered there were maintained. In 1835 the provinces of Astrakhan and the northern Caucasus were excluded from the Pale. In 1843 Nicholas I ordered the expulsion of the Jews from a strip of 50 versts (about 33 mi.) in width extending along the border with Prussia and Austria. Many difficulties were encountered in the application of this law, and in 1858 it was redrafted to apply only to those Jews who would wish to settle in the border zone after that year. A similar law which had applied to the provinces of Russian Poland (where the border zone closed to Jewish residence was 21 versts in width) was abrogated in 1862. In 1827 severe restrictions were imposed on the residence of Jews in Kiev, the largest town in southern Russia, that served as an important commercial center for the surrounding regions which had a dense Jewish population. Under Alexander II, rights of residence beyond the Pale began to be granted to various classes of the Jewish population: in 1859 to merchants able to pay the registration fees of the First Guild; in 1861 to university graduates, as well as those engaged in medical professions (dentists, male and female nurses, midwives, etc., from 1879); and in 1865 to various craftsmen. The right of residence throughout Russia was also granted to *Cantonists who had remained Jews and to their offspring (the so-called "Nicholas soldiers"). The Jews hoped that these regulations would prove to be the first steps toward the complete abolition of the Pale of Settlement. However, they were disappointed when these alleviations came to a complete halt after 1881, as part of the general reaction in Russia at this period. The "Temporary ( *May ) Laws" of 1881 prohibited any new settlement by Jews outside towns and townlets in the Pale of Settlement (this law did not apply to the Vistula Region). Jews who had been living in villages before the publication of the decree were authorized to reside in those same villages only. The peasants were granted the right of demanding the expulsion of the Jews who lived among them. These decrees were bound up with intensified administrative pressure, brutality by local authorities, and the systematic acceptance of bribery on the part of the lower administrative ranks. Occasionally, new places were excluded from the Pale of Settlement, such as *Rostov and *Taganrog (1887) and the spa town of *Yalta (1893). During the years 1891–92, thousands of Jewish craftsmen and their families were expelled from *Moscow . At the beginning of the 20th century political and economic pressure on the Russian government intensified, and in various places alleviations in the "Temporary Laws" occurred. From 1903 some village settlements which had assumed an urban character were given the status of townlets, and the Jews were thus granted the legal right of living in them. Up to the outbreak of World War I some 300 settlements were thus opened for Jewish residence. In 1904 instructions were issued that all the Jews authorized to reside outside the Pale of Settlement could also settle in the rural areas there. In 1910 the Jewish members of the *Duma, N. *Friedman and L. *Nisselovich , with the support of the Constitutional-Democratic Party, proposed a bill for the abolition of the Pale of Settlement. However, the balance of power in the Duma between the liberals and reactionaries made the proposal of demonstrative value only. The extreme Right retorted with a counter-motion "to expel the Jews from Russia"; the original motion was voted upon in February 1911 and transferred to the commission for personal freedom, where it fell into oblivion and was no longer mentioned in plenary session of the Duma. In August 1915, when many thousands of expelled and refugee Jews from the battle zones streamed into the interior of Russia, the government was compelled to permit the residence of these refugees in the towns of inner Russia, with the exception of St. Petersburg and Moscow; thus the existence of the Pale of Settlement in practice was brought to an end. After the Revolution of February 1917 the provisional government abolished the Pale of Settlement among the rest of the anti-Jewish restrictions. The Pale covered an area of about 1 million sq. km. (386,100 sq. mi.) from the Baltic Sea to the Black Sea. According to the census of 1897, 4,899,300 Jews lived there, forming 94% of the total Jewish population of Russia and c. 11.6% of the general population of this area. The largest of the other nations living within the area of the Pale were the Ukrainian, Polish, Belorussian, Russian, Lithuanian, Moldavian (mostly in Bessarabia), and German. These (with the exception of the Germans) were essentially concentrated in their own territorial regions, where they formed the majority of the population. The Jews were a minority in every province (from 17.5% in the province of Grodno to 3.8% in the province of Taurida); 82% of the Jews lived in the towns and townlets of the Pale and their concentration in these was prominent: They formed 36.9% of the urban population, and in nine provinces they formed the majority of the urban population (province of Minsk – 58.8%; Grodno – 57.7%; Mogilev – 52.4%; etc.). In the townlets and many small towns all the inhabitants or the overwhelming majority were Jews. The 10 largest communities were *Warsaw (219,149 persons); *Odessa (138,915); *Lodz (98,677); *Vilna (64,000); *Kishinev (50,237); *Minsk (47,562); *Bialystok (41,900); *Berdichev (41,617); Yekaterinoslav (*Dnepropetrovsk; 40,009); *Vitebsk (34,470), and *Kiev 31,800. It was, however, not only the limitation of their residential area which oppressed the Jews. By force of historical circumstances they were also restricted in their occupations. They were concentrated in commerce (38.6% of the Jews gainfully occupied) and crafts (35.4%); 72.8% of the total of persons engaged in commerce within the Pale of Settlement were Jews, as well as 31.4% of those engaged in crafts. Jewish artisans concentrated in certain branches of crafts (tailoring; shoemaking). Very few had the possibility of engaging in agriculture. The competition among the merchants, shopkeepers, and craftsmen was intense and gave rise to pauperization and the development of a Jewish proletariat which could not be integrated. This situation, together with the incessant anti-Jewish decrees and the waves of pogroms, especially during the years 1881–84 and 1903–06, resulted in a constant stream of Jewish emigration from the Pale of Settlement to Western Europe and the United States. Even this great emigration was, however, insufficient to counterbalance the natural growth of the Jews in the Pale of Settlement. The language spoken by the Jews in the Pale of Settlement was Yiddish (according to the census of 1897 by 99% of the Jews). Most Jewish children received a Jewish education in the ḥeder and the yeshivah. Jewish literature and newspapers in Yiddish, Hebrew, Russian, and Polish circulated in many thousands of copies. The masses of ḥasidim were attached to the "courts" of their spiritual leaders in *Lubavich (Chabad), *Stolin , *Talnoye (Talna), *Gora Kalwaria (Gur), *Aleksandrow , etc. More modern movements such as *Ḥibbat Zion and Zionism, the *Bund and the socialist parties were also active in the towns and townlets of the Pale, either openly or illegally underground. World War I, the disintegration of the Russian Empire, the Revolution, and the civil war in Russia, destroyed the foundations of this Jewish world, which was finally annihilated in the Holocaust. With the perspective of time, assessment of the Pale of Settlement has changed; it is necessary to consider not only its negative aspects but also its positive, unintended results, as forming a framework for an independent Jewry, as the area of settlement of a whole Jewish nation in which generations of Jews developed their own culture, and as the source of the establishment and development of large Jewish centers in America, South Africa, and many other countries, as well as Israel. Sources: Map from The Routledge Atlas of Jewish History Ed. 8 by Sir Martin Gilbert. Routledge is an imprint of the Taylor & Francis Group. © 2007 Martin Gilbert. Yu. Hessen, in: YE, 7 (c. 1910), 590–7; J. Bikerman, Cherta yevreyskoy osedlosti (1911); Dubnow, Hist Russ, 3 (1920), index; J. Lestschinsky, Dos Yidishe Folk in Tsifern (1922), 13–84; B. Dinur, in: Zion, 23 (1958), 93–101; I. Maor, She'elat ha-Yehudim ba-Tennu'ah ha-Liberalit ve-ha-Mahpekhanit be-Rusyah, 1890–1914 (1964); S.W. Baron, The Russian Jew under Tsars and Soviets (1964), index; Y. Slutsky, in: He-Avar, 13 (1966), 41–58; S. Ettinger, Toledot Am Yisrael, 3 (1969), index S.V. Teḥum ha-Moshav. Encyclopaedia Judaica. © 2008 The Gale Group. All Rights Reserved.